The Treat Award for Excellence was established to recognize and encourage achievements in the area of probate law. Each year the College honors an individual who has made a significant contribution to probate law or administration in the area of probate. At the NCPJ 2017 Fall Conference in Ponte Vedra Beach, Florida, Judge Dana Hanley was the Treat Award recipient for 2017. Judge Dana Hanley has served as a probate judge in the State of Maine for 20 years. Several years ago, Judge Hanley was asked to undertake the unification and standardization of the 16 autonomous probate courts in Maine. Judge Hanley believed implementing an e-filing system could achieve those goals. The implementation of the e-filing system turned out to be an 8 year project. Obtaining the backing and key support of the Maine Supreme Court and Probate Judges Assembly. The implementation of the e-filing system has improved Maine’s probate administration by promoting uniformity and streamlining case initiation for the public, attorneys and court staff. Remarkably, Judge Hanley achieved the implementation of the e-filing system with no cost to the State of Maine. In recognizing Judge Hanley’s efforts, the Maine Estate Planning Council stated: “Judge Hanley has continued his quest for efficiency in government by being the lead proponent of putting the Probate Court’s documents and records on the internet. 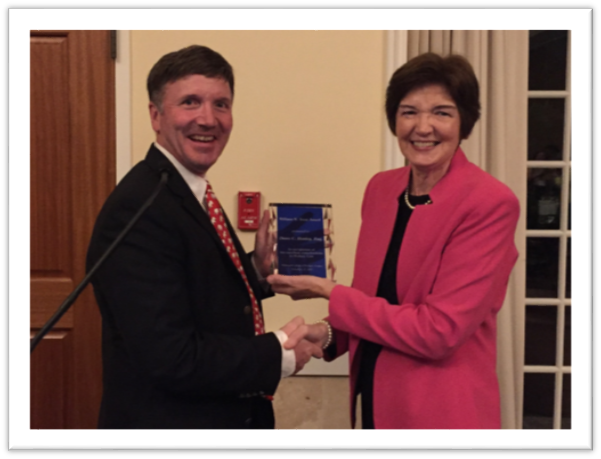 Judge Hanley, with other Judges and Registers across the state were able to complete this, saving the counties untold millions of dollars and brought the Maine Probate Court into the 21st century.” NCPJ was honored to present the 2017 Treat Award for Excellence to Judge Dana Hanley.